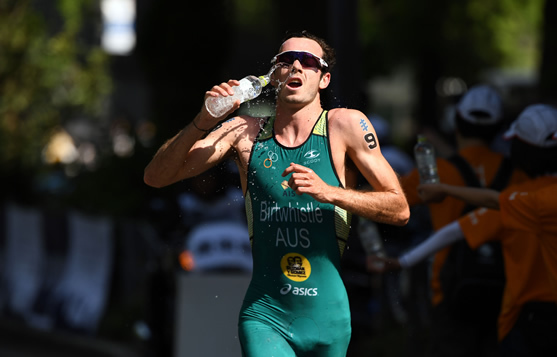 Tasmania’s Commonwealth Games hero Jake Birtwhistle has continued his outstanding form to charge home for a stirring silver medal in today’s World Triathlon Series race in Yokohama. The 24-year-old who won Australia’s first medal of the Games - silver in a frantic finish on day one on the Gold Coast before spearheading the Mixed Relay to gold - again dug deep to run from third to second inside the last kilometre. But not even Birtwhistle could catch today’s winner, two-time ITU world champion, Spain’s Mario Mola who stole the race from the outset of the run. Mola was never headed in one of the most impressive 10km run legs of recent times, to sprint away with the gold, well ahead of the fast finishing Birtwhistle, who had claimed another Spaniard in Fernando Alarza in a dramatic fight for silver. Birtwhistle came out of the pack four kilometres into the run and looked comfortable enough running on Alarza’s shoulder. In the warm afternoon sun, the durable Spaniard found his second wind and opened up what looked like a commanding lead and with Mola well ahead - a Spanish 1-2 finish beckoned. But Birtwhistle wasn’t going away and had other ideas, producing the kind of tactic he has often used in his spectacular climb up the ITU rankings, pouncing like his “Tassie Tiger” nickname suggests racing away for a remarkable silver medal. It was Birtwhistle who ran his way into the hearts of Aussie sports fans on the Gold Coast last month with his satisfying silver behind South African Henri Schoeman, who failed to finish today’s race, before anchoring Australia to a spectacular gold medal in the Mixed Relay with Ashleigh Gentle, Gillian Backhouse and Matthew Hauser. After today’s race Birtwhistle claimed he was “probably credentialed to talk about sprint finishes” which were quickly becoming his specialty - and a handy one at that. “I’m becoming a bit of a sprint specialist now I guess,” said Birtwhistle, who revealed he had been “training solo” in Launceston since the Games. “I thought I was spent in what was my first Olympic Distance race since last November. “But I just dig deep and found something over those closing stages and I’m very happy to come away with the silver. Birtwhistle says his major goal for the season was the Commonwealth Games and with that box ticked it was now time to continue with a successful WTS season which will culminate in the Grand Final on the Gold Coast in September. Birtwhistle is now sitting second in the WTS pointscore behind Mola with Alarza third. In a great day for the Australians in the opening race of Olympic qualification period, Rio top 10 finisher Ryan Bailie was seventh and young gun Luke Willian - who like Birtwhistle made his Games debut last month, finished ninth, with another Rio Olympian Aaron Royle 19th and another youngster in Hauser (fourth on the Gold Coast) 22nd after coming out of the swim up front. Earlier in the day Commonwealth Games Relay gold medallist Gentle produced a sizzling run to just miss the podium, finishing fourth, with Games team mates Charlotte McShane and fellow Mixed Relay golden girl Backhouse ninth and 11th respectively; Natalie Van Coevorden 14th and Emma Jeffcoat 17th. The race saw defending WTS and Commonwealth Champion Flora Duffy (Bermuda) dominate the run to continue her incredible season ahead of Katie Zaferes (USA) with former World Champion Non Stanford (Great Britain) holding onto third ahead of Gentle. The never-say-die Australian powered home on the run after she came out of the water in 34th position - leaving her well off the leaders and in a chase pack left to do a power of work and 1:15 behind the leading group of nine. Undeterred, last year’s WTS silver medallist, got the bit between her teeth and ran past six runners - including three fellow Australians - Backhouse, Abu Dhabi WTS bronze medallist and training partner Van Coevorden and last week’s Chengdu World Cup winner Jeffcoat. The third member of Australia’s Games team, McShane also produced a stirring 10km run to also come from the chase pack to finish 9th. Gentle clocked the second fastest 10km split of the day with her 33.54 to finish 1.37 behind winner Flora Duffy (33.26) and got to within 21sec of bronze medallist Non Stanford (GBR) in third. Meanwhile Albury’s Justin Godfrey continued his PTS3 category dominance with a season opening victory in the first round of the World Paratriathlon Series. It was Godfrey’s 11th major international career victory and a 15th podium finish - his third win of 2018. The 34-year-old triple world champion led the Australian contingent to a three medal haul in perfect conditions. Newcastle’s Commonwealth Games bronze medallist Lauren Parker who finished with a hard fought silver - after leading for the first 3.5km of the 5km run leg and despite missing the finish shoot and having to push an extra 500 metres - which made no difference to the places. And WA’s two-time ITU world champion Sally Pilbeam who was third in the PTS4 category. In other results were: Nic Beveridge (6th PTWC); Sara Tait (6th PTWC); Brant Garvey (6th PTS2);Josh Kasulke (7th PTS5) and Jonathan Goerlach (7th PTVI).